This is my 1st payment from perfectbux.com in several days ago. They just sent me the payment right after I submit the request, in less an hour!!! Very fast as I can see. my 2nd payment from perfectbux.com, in less an hour!!! Very fast as I can see. t PerfectBux.com, you get paid to click on ads and visit websites. The process is easy! You simply click a link and view a website for 30 or 60 seconds to earn money. You can earn even more by referring friends. You'll get paid up to $0.02 for each website you personally view and up to $0.02 for each website your referrals view. Payment requests can be made every day. The minimum payout is as low as $2.00. And the payout time is within 24 hours, guaranteed! 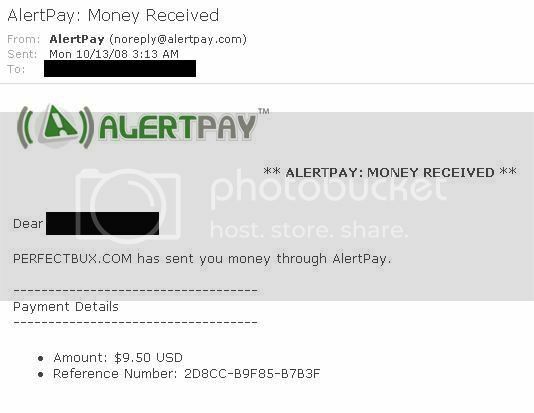 This my 3rd consecutive payment received from the perfectbux admin.It is paying promptly to it's members.join now and reap the benefits. Note: Dear cmaker: Your payment from PerfectBux.com. Please share your success story with your friends. Thanks for being with us!